I finally did it! I finished another project that’s been sitting on my “to do” pile. This was a tough one. When my Grandmother passed away, I didn’t ask for any of her things. She gave me pictures and her mother’s china, back when she was still alive, so I wasn’t looking for anything more. Even still, I know my Grandmother loved my sister’s and I, VERY much. There were other things I’m sure she would have liked us to have had, but towards the end, she moved several times, plus she was in a nursing home for awhile, so lord knows what happened to her belongings! Anyways, months after her passing, I was asked to stop by my Dad and Step-mom’s house on the way home from work, to pick up my “inheritance.” It had been sent to their home. Needless to say, I had NO idea what to expect. I was told that my sisters got first dibs, but I could have whatever was left. Being the oldest, I’m the keeper of MOST of the family heirlooms, so this was only fair. This picture doesn’t do it justice. It looks “nice” in the pic, but it’s mostly dime store stuff from the 1980s. Yes. Everything came in the box you see, complete with the egg carton organizers. My sisters and I laughed until we cried. I can honestly say, that I had NEVER seen most of this…”stuff.” My Grandmother had some beautiful jewelry, “real” jewelry. I don’t remember 98% of the “stuff” in this box, and neither do my sisters. My youngest sister wasn’t going to take anything, but I persuaded her pick out a few items. She took apart one of the necklaces, or earrings, or something…and made it into something she’d actually wear. My other sister did the same thing. We’re all crafty people! Unfortunately, there’s no sentimental value to any of these costume pieces, and probably not much any monetary value either. My Dad was able to offer some insight into a few of the older items. 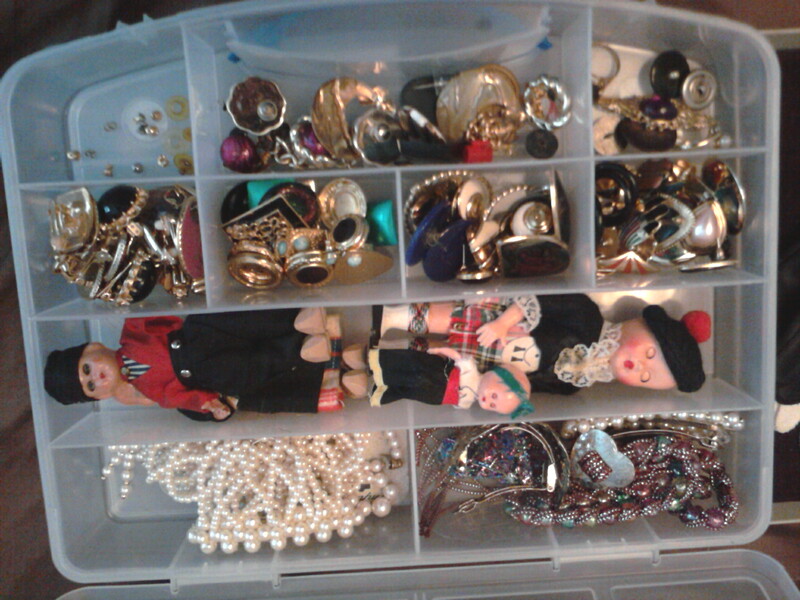 Apparently, my love of costume jewelry goes back several generations. Some of the costume pieces were my Great Grandmother’s, the rest looks like dime store stuff from the 1980s. These clip-on earrings were probably my Great Grandmother’s. They’re kind of creepy! Makes me happy that “weirdness” is genetic. Love the faces on the clips. This was probably my Great Grandmother’s. I’ve actually worn this pin on a jacket. It has a “steam punk” feel to it. While words “Salvation Army” have bantered around, I decided to keep my entire inheritance, with the exception of the egg cartons. Those HAD to go! Yes I’m the proud owner of a lot of…junk. There! I said it!!! But there’s also a few “interesting” pieces in there, too. 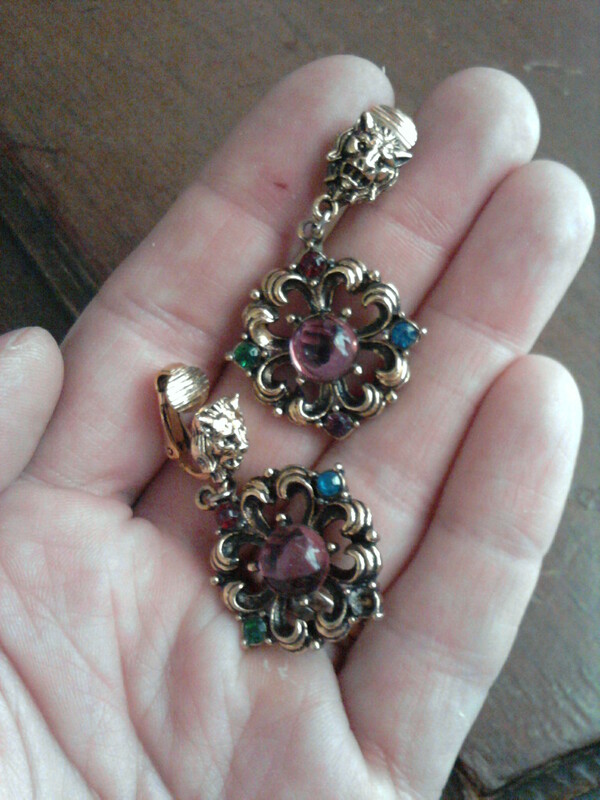 I do like vintage junk-jewelry. 🙂 I LOVE the stuff that was Great Grandma’s! I’ve worn this pin, too. I think it looks rather “jaunty” on my beret, but that’s the bohemian in me talking! 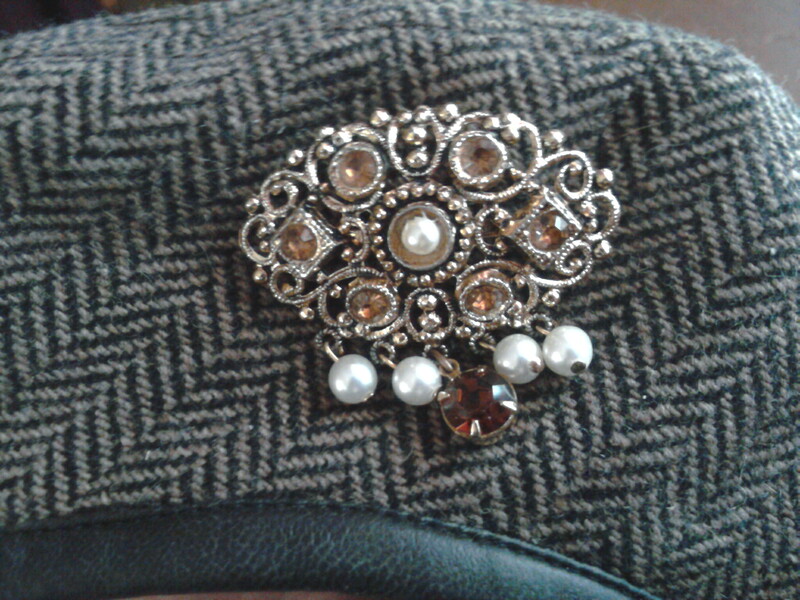 I’ve worn some of the old broaches. I might pull apart some of the gaudier 1980’s pieces, and turn them into something else. But until then, I needed to get everything organized. Everything from the cardboard box, all has a new home! I got this plastic storage thingy from the hardware section. It’s supposed to be for storing nuts, and and bolts, and whatever. Very practical! Much better than the egg carton system…also part of my inheritance. Not sure where the creepy doll family came from. I’m happy. Everything’s out of the box. I feel like I accomplished something, and I finally have some closure to this aspect of my Grandmother’s death. Previous postI got another project off the “to do” pile. VERY bittersweet. My Grandmother had sooooo many neat things, so many collections: antiques, and fancy china dolls, and whatnots, but we won’t get into that. I’m just glad she was able to give me and my sisters “most” of the things she wanted us to have, while she was still alive and in control of her estate. Let that be a lesson as well! She wanted to SEE us enjoying the things she loved. I have no idea what the story is, behind the creepy dolls! My Dad said that they either belonged to my Grandmother or possibly even my Great Grandmother, as an adult. They’re worse with their eyes open. I can’t display them. They look like they might murder me in my sleep! 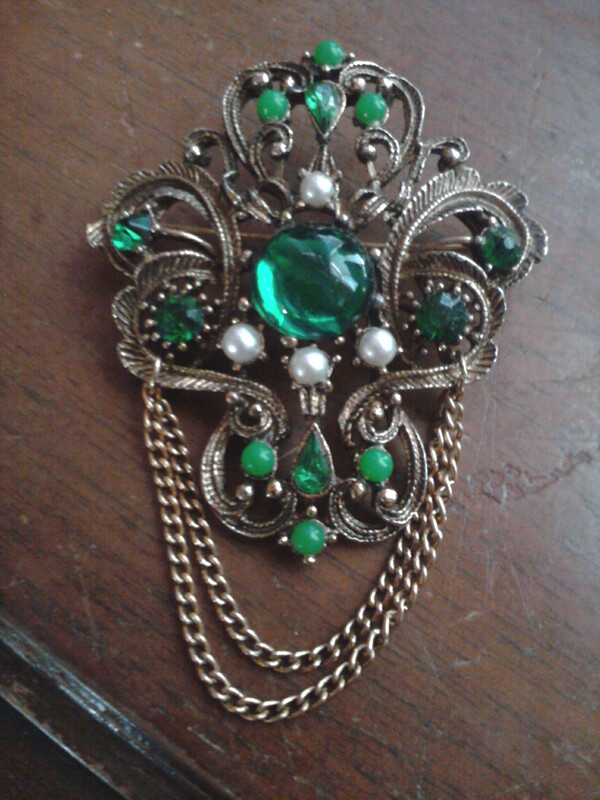 I love all the old costume jewelry from my Great Grandmother. It’s not really worth anything, despite its age…but it’s so old, it’s almost back in style again, thanks to steampunk. 🙂 I was surprised that my sisters didn’t want a pin, but they aren’t into all that as much as I am. I’ll actually wear some of the other vintage pieces, too, so at least they’re being enjoyed again. I have several strands of vintage, fake pearls. I think they’re fun to wear all at once, with a tank top and jeans. The old ones have pretty clasps, and look MUCH better than the ones they sell today. I agree. It was hard going through my mother’s things, when she died. Glad you were able to have a few mementos from your friend. So sorry for your loss!!! That must have been so difficult for you. You’re lucky. It may be costume but as you said it was hers. I didn’t get anything when gram died cause I was here and my evil cousin was there. But I got what I consider all the “good” stuff while she was alive. When my mother in law died I really wanted a ratty old fur jacket, not sure what kind of fur, but I did want it. As with your grandmother, my mother in law moved around and was in a nursing home. The jacket was gone. I also got some costume jewelry which I still have. 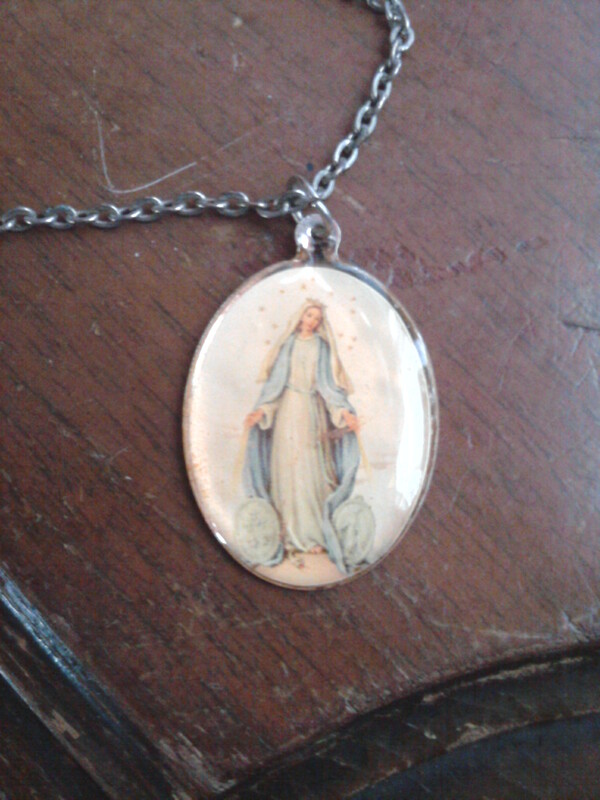 When my mother died I got her costume jewelry and one good ring. But I got all her photos. Which are priceless. Unfortunately she labeled the ones whose picture I know and did not label the others. Like her with some guy who wasn’t my dad. I’ll never know. Oh and I got grandad’s cabinet. He was a cabinet maker and we thought the bookcase was made decades ago. I had it appraised. The guy said it comes from the 40s. Oh well it’s beautiful and sits in the dining room. Unfortunately my will says it goes to my evil cousin…. and when dad dies I’ll get a painting –a self portrait –he did that used to scare me as a child. But now I’ll be happy to have it. My that was long winded of me wasn’t it? I think EVERY family has a relative or two (or more) that pulls stuff like this, after a family member passes away. The pictures were the most important thing, and I do have those. 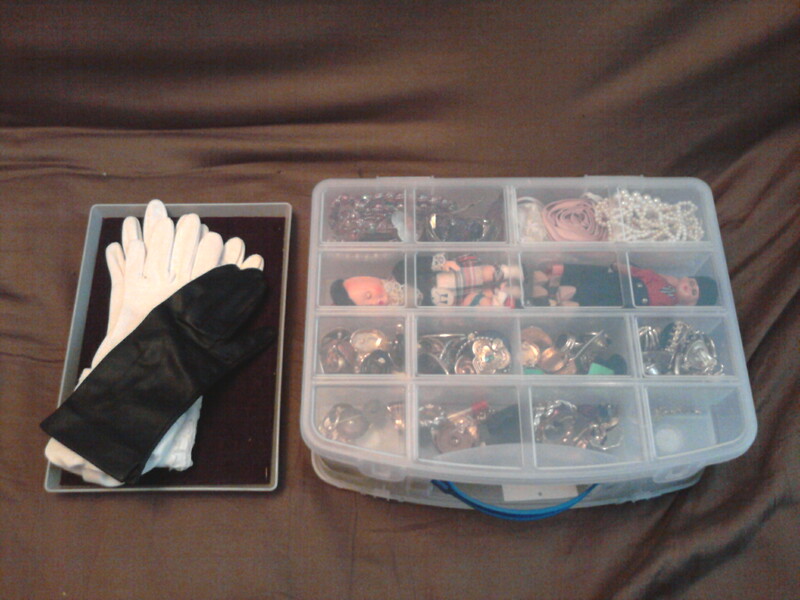 The jewelry in the box…I have NO memories of anyone wearing this stuff. I’m not sure what happened to the pieces she wore all the time, but I have my guesses. LOL! 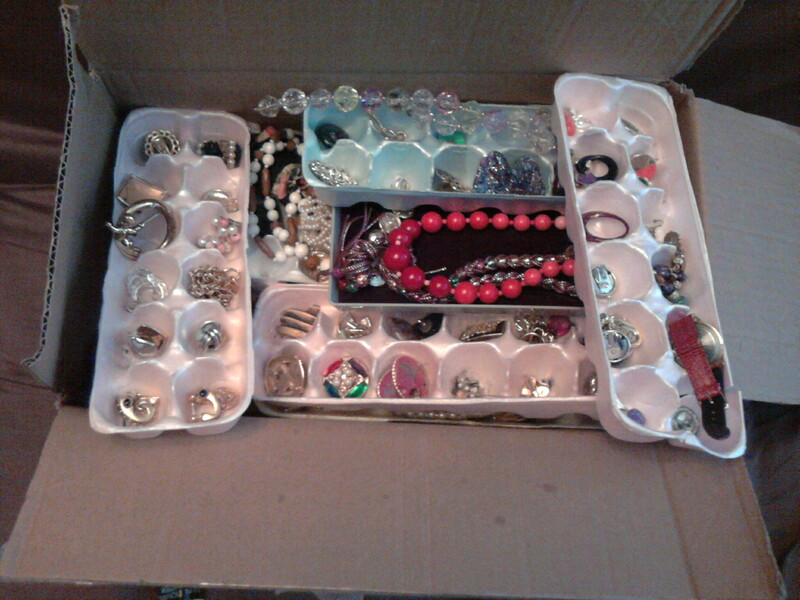 well, I’d have to see the individual bits, but costume jewelry can be fun! though some of the 80’s stuff was kind of scary… like the big bead necklaces (ala the pink on in that pic) Those I have never and will never wear, LOL! You know, I don’t think I own any “real” jewelry… oh, no, I have my grandma Mutchler’s wedding set (my grandpa gave it to me when i was 12, made everyone else mad) and I guess I have hubby’s mother’s wedding set. I don’t wear either one because they don’t fit. wow! lucky you!! nice collection. amazing how the pieces seems so timeless. 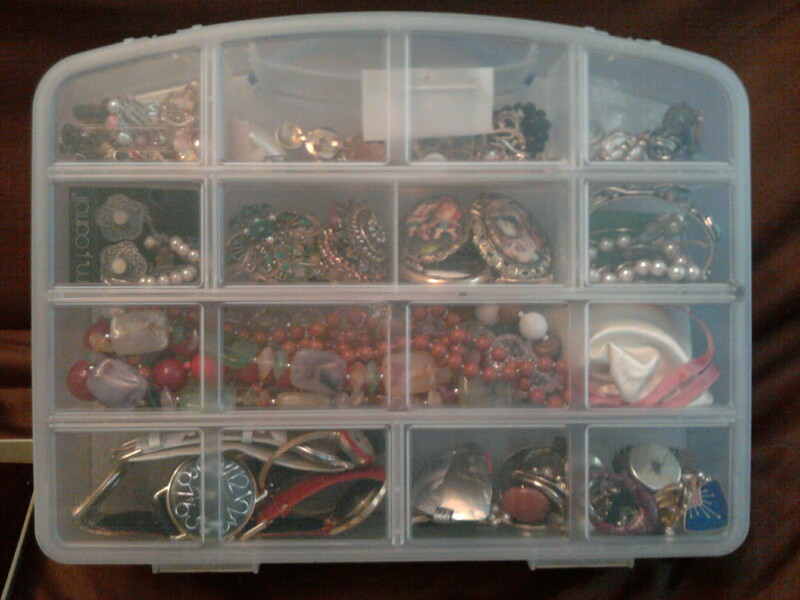 I also adore my grandmother’s jewelry collection. I only have a few pieces with me yet those are my favorite.